Margaret Luella Van Zante was born September 7, 1925, to Gradus and Bertha (Van Gilst) De Cook, in Pella, Iowa. 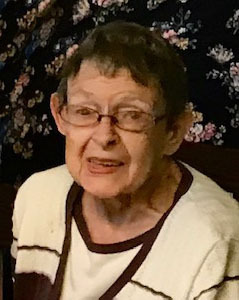 She passed away at The Cottages on March 18, 2019. Margaret attended the North Porterville country school near Pella. She met Lawrence uptown on the square in Pella, and they were married June 12, 1947. They took a honeymoon to Denver, Colorado, and resided in the country outside Pella. To this union they were blessed with four children: Chuck, Linda, David and Denny. Margaret was a housewife and started as a cook at Fair Haven in 1967. She worked there for many years and later became the head cook for them. She was known for her delicious fried chicken and homemade bread. Margaret was a lifetime member of the Third Reformed Church, until her health would not allow her to attend. She was a cancer survivor who was given six months to live, but survived for more than 30 years. Margaret was a very patient person who was slow to anger, and had a wonderful sense of humor. She was a faithful wife of over 71 years and a loving mother. Margaret was preceded in death by her parents, her brother Henry De Cook, and her nephew Steve De Cook. Those left to cherish her memory. . .
Margaret is also survived by her sister Wilma Rus of Grand Rapids, Michigan, her brothers: Art De Cook of Pella, Don De Cook of Indianola, and Rob De Cook of Pella.